The real Jack the Ripper was never caught and his identity remains a mystery. But now we have the chance to catch him – or her – and thus reveal the person behind the crimes. Among the suspects are names like Sherlock Holmes, John H. Watson and Inspecteur Lestrade. Some of the suspects are people who in one way or another were part of the real investigation. The game Mr. Jack is for two people, who gets very different conditions. One player represents Jack with the goal to escape the crime scene without having his/her identity revealed. The other player represents an investigator who has to find the killer before the break of dawn. 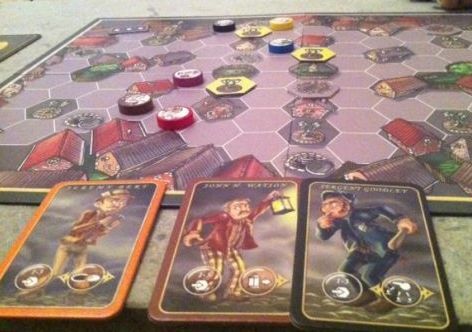 There are eight suspects on the streets this night, and the players take turn moving the different characters. The investigator is trying to eliminate possible suspects, and Jack is trying to escape. It only takes about 15 minutes to play the game, once you have learned the rules. There are a lot to learn about the different strategies, but for new players it seems easier to be the investigator. This player can usually eliminate many of the suspects early on, and then it is fairly easy to expose the guilty person. Despite this it is a fun game, and since it does not take long to finish you can play it several times in a row, and the rules are easy to learn. A perfect Christmas gift for the family who loves board games!